In 2014, a staggering 7.64 billion plastic bags were handed out by supermarkets in England. To help encourage people to re-use their old bags, and find more environmentally friendly alternatives, shoppers are now being charged 5p for every new plastic bag they use at large stores in England. 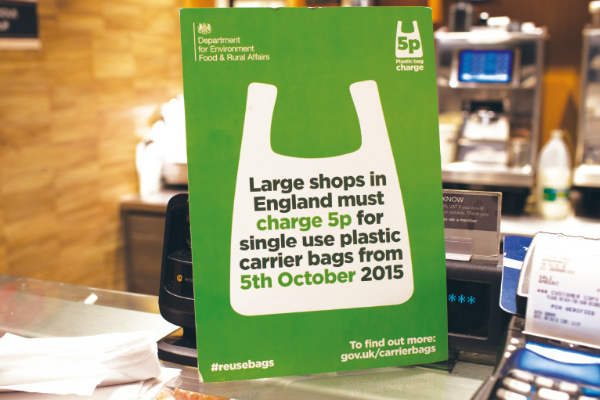 There was already a lot of support for the carrier bag charge before it was introduced on 5 October 2015 but the Department for Environment, Food & Rural Affairs (DEFRA) knew that without an eye catching campaign to publicise what was happening shoppers would be caught off guard. They contacted DESIGN102 to help ensure that the introduction of the charge went smoothly. A bold, engaging 5p carrier bag graphic was developed, and used as the main logo and identifier for the campaign. It was applied to a range of materials to help support the initiative and to engage the public. 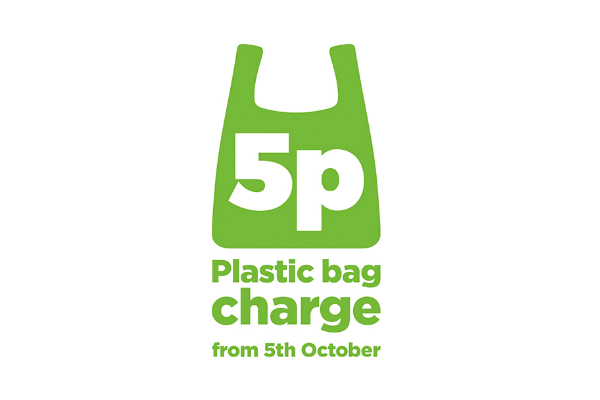 The 5p bag logo was used throughout the campaign. One of the more challenging aspects of the 5p charge was the fact that not all bags and retailers were included. Most importantly, shops employing less than 250 people are exempt from the charge. 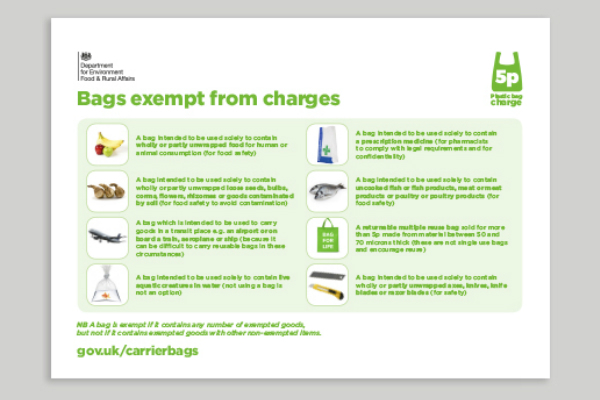 There are also a number of exceptions depending on use – for example bags containing raw meat, or a goldfish (!) are excluded. The cue card was designed to help educate retail staff and customers. Theresa’s designs were used by retailers across the country. The new carrier bag charge has been received positively and is now in effect across England. Since the charge was introduced Tesco has reported that single-use plastic bag usage has gone down by 78%! A great result and hopefully a trend that will continue. You can see more work from DESIGN102 at www.design102.co.uk.